As an establishment you have to decide: are we going to be a full-service restaurant or casual walk-in? Once you start taking reservations and proceed to warn patrons about the 15-minute grace period and two hour seating limit, you’ve slated yourself into the full-service category. It also means you need to spring the extra minimum wage hours to hire a host or hostess. 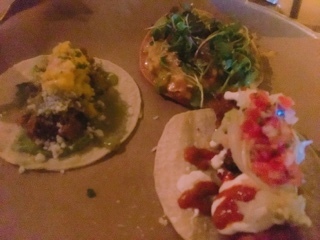 Upon arriving at La Carnita, we awkwardly waited at the empty hostess stand. After two food runners passed us with no acknowledgement and a line of other diners started forming, my husband approached the bartender to inquire about a host, only to be told that they have one and to just go back and wait. From there the service improved, the waitress that seated us quickly took our drink orders and provided good suggestions. The Peach Don’t Kill My Vibe ($13) she liked was rather refreshing filled with fruity flavours that hid all hints of alcohol. 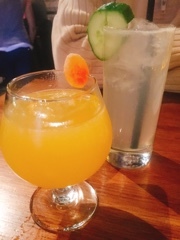 Whereas, the Spring It On ($13) we chose ourselves had none of the promised St. Germain or cucumber - it’s really best classified as gin with simple syrup. Yet, when I wanted another cocktail and stopped one of the runners, I was informed he couldn’t take the order and would go find someone else. After five minutes and no follow-up, I decided to skip the second drink, our food would be finished soon anyways. 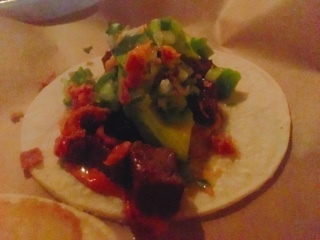 Having ordered practically all the tacos, their fish ones reign supreme. 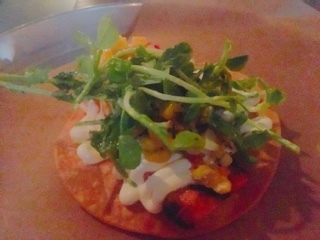 The best was the grilled fish tostada ($9.95) which starred a thick slice of perfectly cooked Arctic char; it was still jewel-tone in the centre. The light smokiness from the grill went well with the sweet corn salsa and hint of Diablo's Fuego hot sauce in the background. But, it’s messy. The crispy tostada has no chance of holding up against the heavy fish – consider replacing it with a regular tortilla wrap instead. The In Cod We Trust ($5.79) combines the typical deep fried battered fish with crunchy red cabbage and green apple slaw. There’s plenty of flavours thanks to the lime crema and “Voltron” sauce (a spicy soy drizzle). 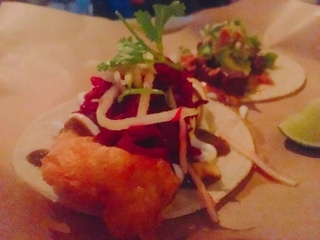 Sure, fried fish tacos are practically a staple item at every family restaurant in Toronto, but La Carnita does them well. 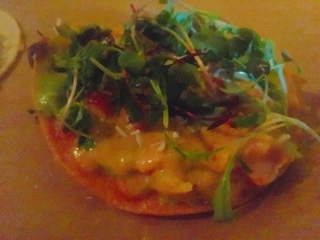 Although it was included in the menu description, I wasn’t expecting the coconut milk used in the tostada de ceviche ($7.95). 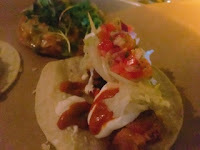 Hence, at first bite was thrown off by the sour cream taste and consistency of the ceviche. In hindsight, it wasn’t terrible, incorporating plenty of cubed tuna and bits of tomato and cucumber. It just didn’t look appetizing and if it weren’t for the crispy shell, the mixture would be way too soft. The daily special ($5.25) wasn’t any better. That evening featuring pulled pork with mango salsa. 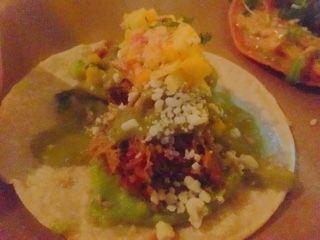 The spicy salsa was delicious, but even with all the flavours couldn’t save the terribly dry pork. 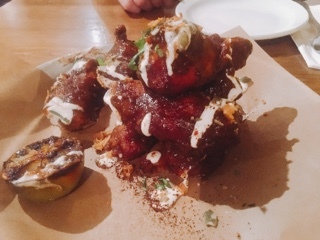 If you craving meat, I’d go for the ancho BBQ wings ($15.95), the crispy edges smothered in a poblano lime barbeque sauce that’s thick and flavourful, almost like mole. With seven to an order, there’s also plenty to go around. By the end, I wasn’t sure whether to stay for a slice of the Sweet Jesus ice cream cake or just grab something on the way home. Our waitress was awfully friendly and the food came at a respectable pace. Yet again, we did have less than half an hour left to the strict two-hour seating limit. In the end, we decided to leave while things were still good. On the way out, sure enough, another line had formed by the hostess stand. Poor patrons, where’s the delusional guy in the tropical shirt when you need him?